CatDV makes browsing the content of your storage a breeze whether on-line, off-line, near-line or archived. Searching media could previously have taken hours or days, with CatDV finding media takes seconds. 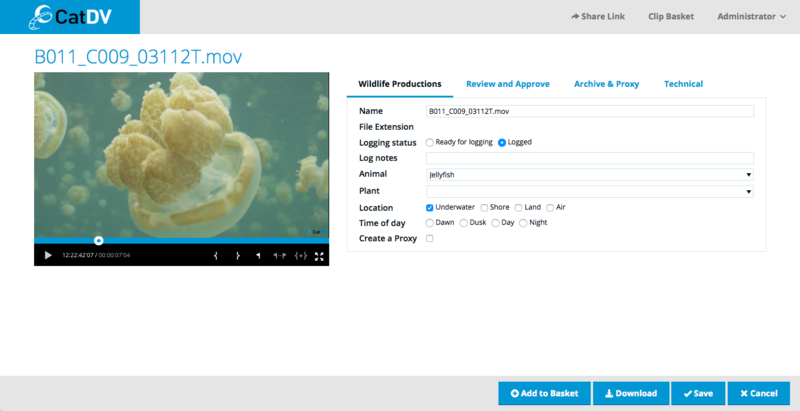 CatDV’s configurable Verbatim Logger is a fast and intuitive way of logging footage, even for new CatDV users. Notes, subclips, in and out points and markers can be created on the fly and playback controls are completely configurable. Flexible data types (radio buttons, check boxes, heirarchical lists) make the entry of even complex metadata fast. With the plethora of cameras and format on the market today, to say nothing of user created content, transcoding is a critical issue for any organisation with lots of content. CatDV’s has powerful transcode capabilities, both in the desktop clients and in the CatDV Worker (the automation engine). CatDV can also be configured to work with other hardware or software transcoders. CatDV at its core is a powerful database for media assets. Any organisation that creates or commissions content for broadcast on any channel (TV, film, web, internal) will benefit from the ability to find and reuse content. There are a range of options available to share CatDV functions throughout organisations, from the powerful desktop client, through simpler web clients to completely tailored web interfaces using our flexible APIs. Take a look at this customer storyfor more details. A number of our customers use CatDV’s print functions as part of their paper based review and approvals process. This is particularly relevant for stills libraries but is also been used for video using the filmstrip views.